Open up your Airport Utility from the Utilities folder in Applications. In there you’ll find your base station. Click it and click Edit. If you press and hold the option key while clicking edit you get a bit few more options but mostly information (in the form of a summary tab). I think it’s advisable to give your base station a Static IP address. But that’s optional. If you do, make sure the IP Address is not in the DHCP range of your router (If you have one). 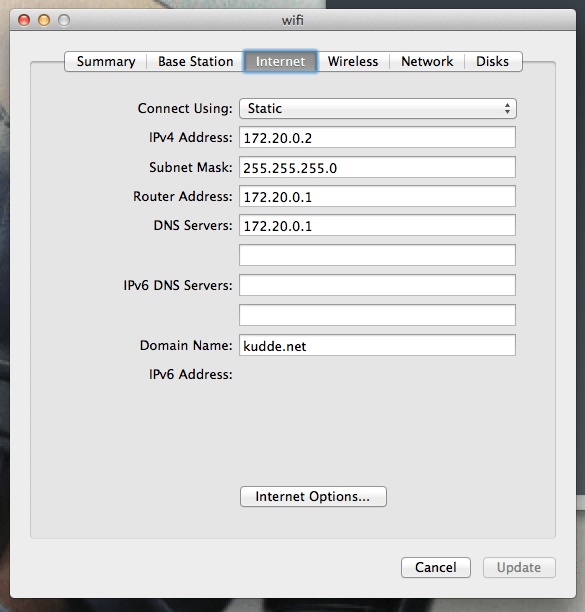 If your Airport Extreme is the router, you are required to set up a static Address. 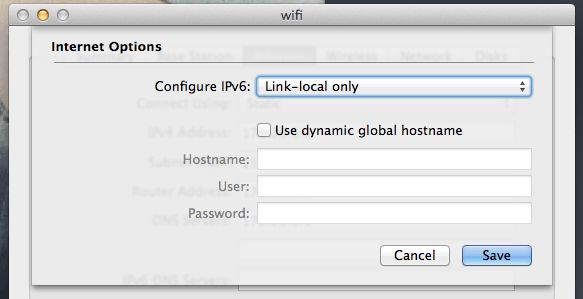 You may want to limit IPv6 to local-link only, which you can do in the Internet Options button. IPv6 generally isn’t really in use yet for actual consumer use. More modern devices on your network may use it. Some internet services support it. But doing without it is just fine for the next few years. IPv6 slowly gains more and more support though. 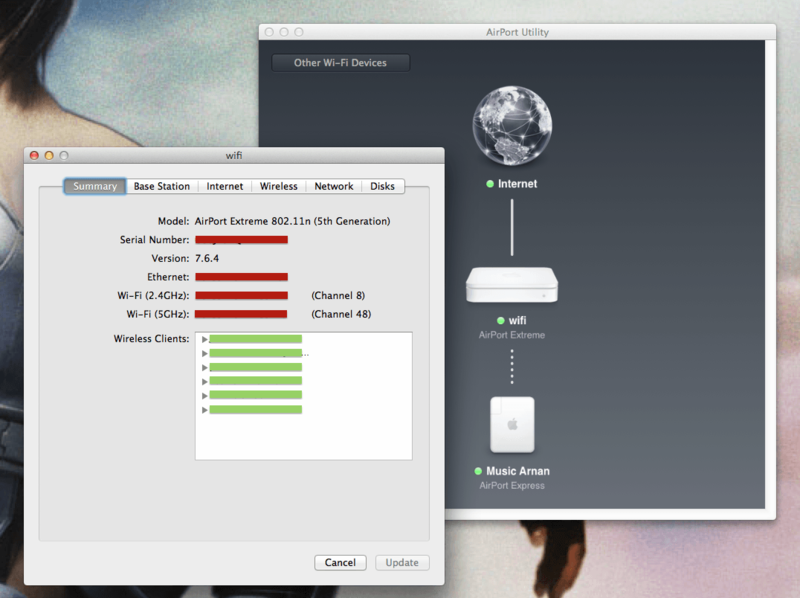 Apple simplified the Wifi settings compared to earlier versions and it seems it actually works now. So this should be fairly straight forward. They did away with most advanced settings, which is a bit of a shame. But as long as that it works that doesn’t really matter. Obviously you want a distinct name for your wifi and not something generic like most people use. I bet half of them don’t even know which one is theirs. Look at this mess. Madness, so set a cool name that you can identify – Like your family name or a item or character you like. Pretty much every wifi base station in existence can change it’s wifi name, there is no reason not to. As you can see, I still use names from the Manga Ghost in the shell. 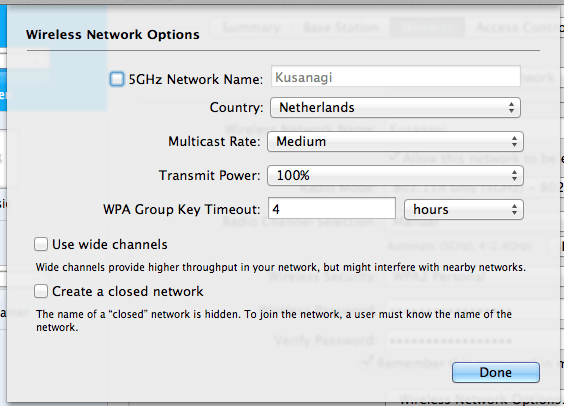 My network is named Kusanagi. After the lead character. Setting a custom name is also useful for when you have guests over you can just tell them to connect to it without having to memorize a codename no-one can understand. Using WEP these days is stupid. Also using Mac Authentication is pretty useless. So if you use that. Disable it. WEP has been cracked years ago and is therefor useless. MAC Authentication – Everyone, even a 12 year old, can copy and spoof your MAC Address in seconds. MAC Authentication slows down your network. Which is undesirable. These days using WPA2 is the way to go. Older base stations also support WPA or WPA/WPA2 (a mix of the two). The latest of Airport Extremes have WPA2 Personal (WPA2) and WPA Enterprise (Using a Radius server). 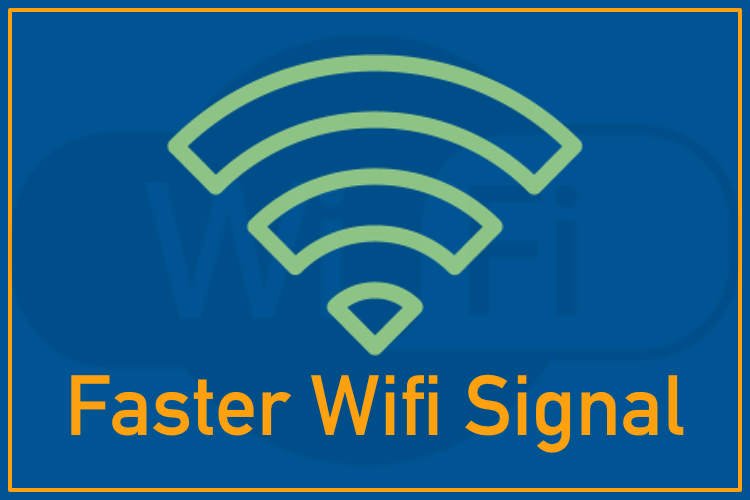 Most users should use WPA2 Personal and make sure every other base station uses that same setting. Not the WPA/WPA2 setting. But WPA2 or WPA2 Personal. This makes sure there can be no communication issue between the 2 stations and thus they work faster. Picking the right channel and radio mode. This is perhaps the most important bit and the performance of your wifi depends heavily on it. 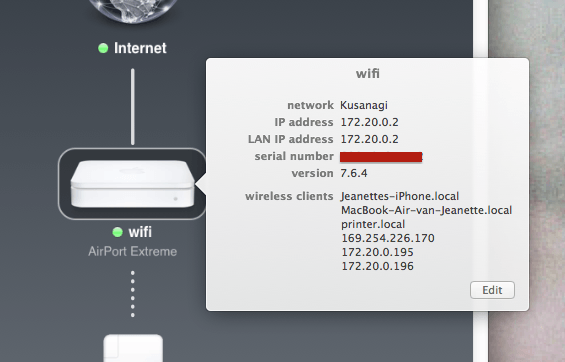 I use an application called Wifi Explorer on my Mac to see what networks are available and which channel they use. The app can detect both 2.4Ghz and 5Ghz networks if your device supports them. Every ‘hoop’ is a wifi Network. You’ll notice that I have pretty much the whole 5Ghz spectrum for myself, almost everyone uses 2.4Ghz. This means that the 2.4Ghz networks are by default not at peak performance. Simply because the frequency is saturated with radio signals. If you do not have devices that use 11b (11mbit) or 11g (54mbit) you may want to just not broadcast that. 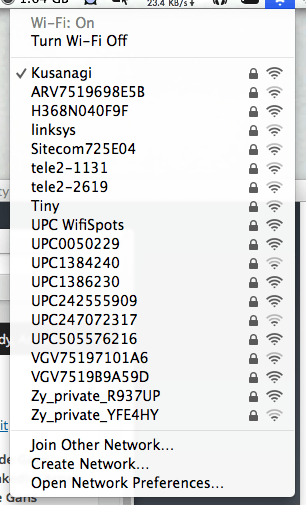 Pick the 11n (130mbit and up) option. This may increase overall speeds a bit. For the channel selection refer to the above charts, if you scan your surroundings you’ll hopefully find a channel that isn’t used at all. Or has few networks on it. Pick that one. Do this for both 2.4Ghz and 5Ghz. Pick the least used channel. This ensures optimal speeds. 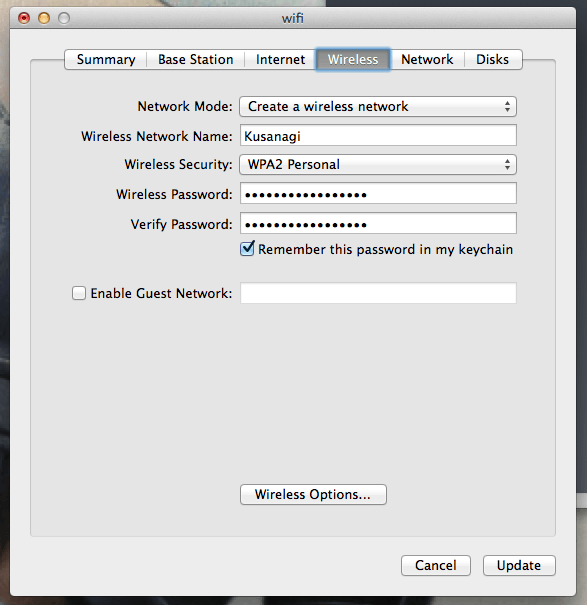 Under the tab “Wireless” click “Wireless Network Options” and disable the “5GHz Network Name”. As a sort of quality assurance you might want to raise the “Multicast Rate”. 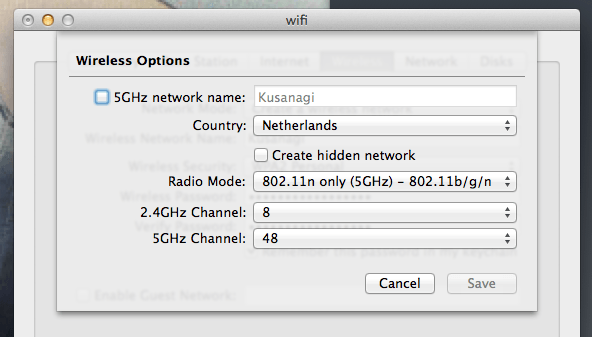 Disabling the separate name basically merges your 5GHz network into your 2.4GHz one. Leaving the computer/device to decide which to use. And you’re kinda feeling in the dark, hoping it picks the fastest. But that’s alright. Most devices are made to use the best connection and switch when required. The multicast rate is a bit more vague, but from what I’ve seen, read and learned it basically sets a acceptable speed limitation. Such as – If the device can not meet a bare minimum speed. It’s not getting on the network. The default setting is low. Which pretty much lets anything connect regardless of signal quality. I prefer speed. So I’ve set it a tad bit higher, to medium. This forces the computer to find a better signal. This is especially useful if you use multiple Airports. So that the iPhone does connect to the one which has a stronger signal and not the one downstairs at the other side of the house when you’re standing next to one. Wide channels is a mechanic in wifi where a signal may utilize multiple frequencies in order to boost throughput. Basically it opens multiple lanes just for you on the highway. In my experience this doesn’t work. At least not when combining a brand new model Airport and an older one which doesn’t have this option (and thus doesn’t support it?). Obviously I don’t know what this option does between 2 newer models since I only have one. But I’ve disabled it and it’s fast now. You can disable this option in the tab “Wireless” under “Wireless Network Options” same as the above 2 settings. Untick the box “Use wide channels”. 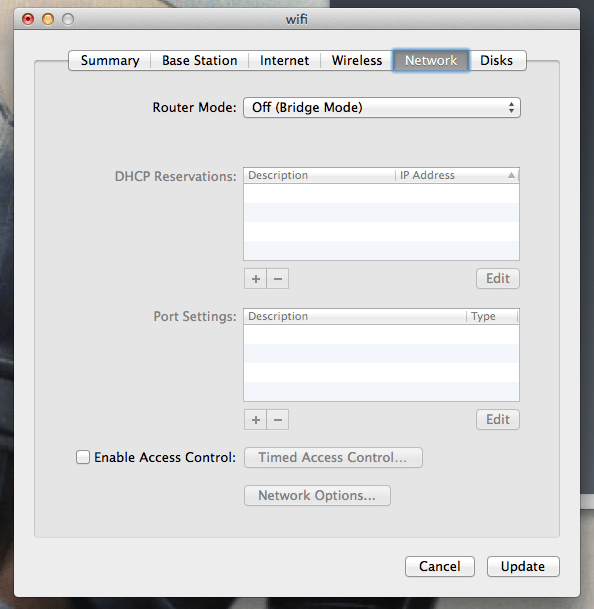 If you have a modem/router you need to set the Airport Extreme to Bridge mode. Using NAT in the Airport too, slows you down, if things work at all. Your modem already handles NAT, having a Double NAT is useless. If your Airport is the router. Set it to DHCP NAT. To close, all of these settings, tips and things apply to any Wifi network. Regardless of your basestation. I just happen to use the Apple one. Remember, while these settings work for me, they may not, or not entirely, work for you. Fiddle around with them or skip parts where needed to get optimal performance and usability. My initial setup took me 3-4 days to get right. Endless testing and trying. Next post: Summersale 2017 – Buy AdRotate this month!